Links: Herdsires, Females, Geldings, Crias, Argentine, For Sale, Sold! I cannot put into words the excitement we feel about this miniature herdsire. He is a compilation of some of top the miniature bloodlines in America: Bolivian Crown Jewells, Razzel Dazzel, Taziata, Some top minis exist of both sides of his ancestry. Beyond that-just look at him. Gorgeous, great fiber and conformation. He even has some beautiful gray coloring. And size? Well at just over 2 years of age-he is a compact 35 inches. We will see if he is ready for the ladies next spring and plan for him to be the foundation of our future mini herd! We will match him up with some of our best mini females with anticipation of some of the best minis in the Midwest! Here is our soon to be Junior Herdsire! Notice the "inkblots" on this boy's face? As a result, we gave him the name of the famous inkblot test. He has incredible coloring and conformation as you can see as well as lots of energy! We expect him to maintain the calm personality of his dam & sire. 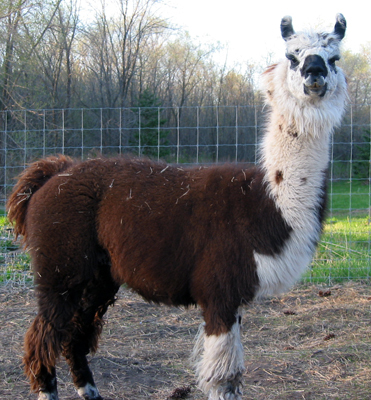 His fiber is silky on his neck & somewhat curly throughout the body, similar to Gustavo. This guy promises to be a pasture standout & probable great herdsire. We are planning to keep him to maintain Gustavo’s bloodline. 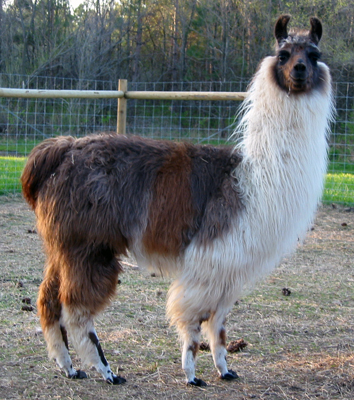 He will be shown this summer in 4-H & perhaps some Midwest llama shows, too! For sale for $1500.